Android has become the dominant OS on mobile devices and has expanded to become the OS powering a growing array of consumer electronics. When you are creating products representing OEM brands or dedicated products for embedded devices you have to transform Android at the ROM level - it's not just app development anymore. 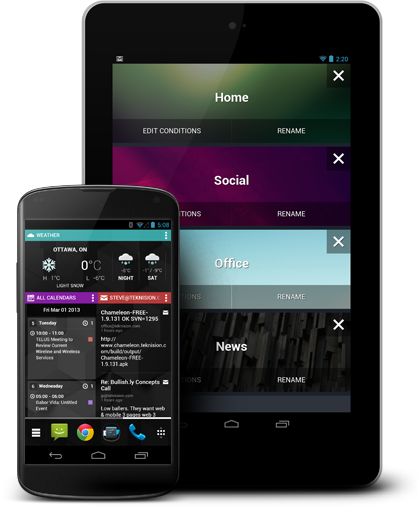 Chameleon is a content centric launcher that turns home screens into valuable information portals. Now your favourite content is at your fingertips soon as you turn on your device. 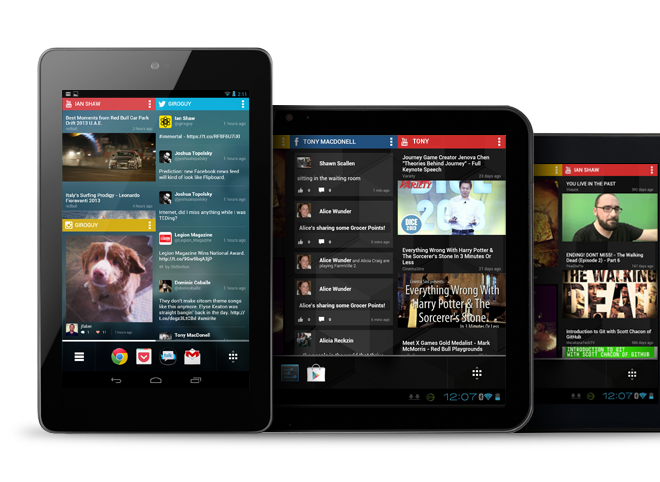 Chameleon Thrives on Android Tablets and Phones. From 5″ to 10″ and all sizes in between, Chameleon was specifically designed to work beautifully on both tablets and phones. A Home Screen Designed To Fit Your Lifestyle. Chameleon lets you create multiple home screens each with your own layouts of widgets and apps. 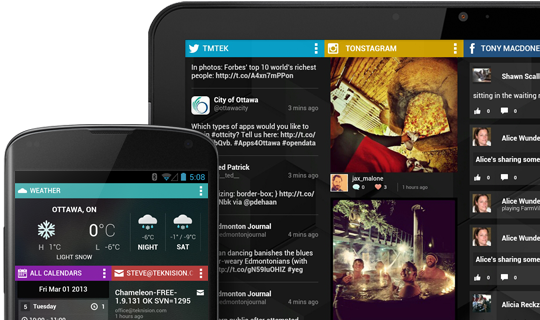 Chameleon widgets are designed to give you the most relevant information that you want, when you want it. Your information needs may change throughout your day, so Chameleon includes an innovation context system. Through our context system you can create rules so that whenever you unlock your device you are presented with the Home Screen that is immediately valuable to you. Chameleon Home Screens context rules can be set based on GPS locations, WiFi networks and time ranges, allowing you to define which Home Screen is the most relevant for any situation. Thanks for your interest. We look forward to hearing from you.